The road to entrepreneur success in small business. For a book review written by Paul Post reporter for The Saratogian on January 8, 2016 about "Blue Print For Success" go to: url:http//www.saratogian.com/general-news/2016018/entrepreneur-shares-tips-for-aspiring-small-business-owners. I was honorably discharged from the USAF in 1971. I embarked on a program of reading, listening and studying “experts” regarding planning, organizing, controlling, motivating and salesmanship, which was instrumental in my becoming a successful small business entrepreneur. I retired in 2010. Over the years I founded three companies that were totally successful businesses: J L Hansen Associates, Hansen Petroleum and Total Fuel Quality. 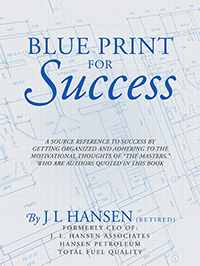 Perhaps you can become a successful small business entrepreneur by following the blue print in this book.